Rookies selected in the 2016 NFL draft have hit the practice fields in preparation for their first preseason games this month. The league’s scouts, meanwhile, are already preparing for next year, scouring university campuses for background information on new prospects. Trainers, tutors, even the waitress at a player’s favorite restaurant — all attract the scout’s eye as potential reservoirs of good dirt. Despite that thorough sleuthing, though, anecdotal evidence and academic studies suggest that the league’s evaluation process is riddled with racial bias. It’s not explicit, where teams purposely treat black prospects one way and whites another. Instead, the draft is warped by implicit racial bias, as scouts and coaches evaluate players without being aware of the unconscious racial attitudes and stereotypes rummaging through their brains. An associate director of player personnel at a Power 5 conference school who asked not to be named, provides a common example: Scouts assume that black players hail from single-parent households “unless we tell them otherwise,” he said. Similarly, when ascertaining potential substance abuse issues, scouts ask different questions for white and black players. About whites, “They want to know if he’s a drinker,” he said. “How many times does he go out a week?” is a common question. They “never” ask if a white player failed drug tests. Sociologist J.R. Woodward conducted a 2004 study while teaching at Montana State University that mined how publications graded college prospects. Scouts, he found, generally showered black prospects with physical accolades, whites with mental ones. When a scout studies the game film of a black quarterback, phantoms of our racial past apparently spook him into seeing things that aren’t always there. Natural athleticism manifests itself, masking the unremarkable speed and agility that actually exist. A quarterback who excels at reading defenses somehow appears like one uncomfortable with the task. Yet, many NFL front offices see no systemic problem. Auburn quarterback Nick Marshall runs a drill at the NFL football scouting combine in Indianapolis, Saturday, Feb. 21, 2015. Robert Griffin III, a star quarterback whose radiance dimmed after a year; Trent Richardson, a halfback who favors running into his offensive linemen rather than the holes they create; Matt Kalil, an offensive tackle who may block decently on Sunday or be an accidental accomplice in quarterback Teddy Bridgewater’s murder; Justin Blackmon, an indefinitely suspended wide receiver who betrayed his talent after never-ending affairs with Mary Jane and Jack Daniel’s; Morris Claiborne, a cornerback who lets mediocre receivers catch the ball, rattle his face mask with a stiff arm and waltz into the end zone; Mark Barron, a safety who prevented nothing for the Tampa Bay Buccaneers and is now an overpaid, second-rate linebacker. Players, who believe that their on-field experience affords them a privileged vantage point to appraise talent, often wonder why certain prospects get selected. Building close relationships across racial lines regularly cleanses people of explicit racial animus. This commonly happens in the NFL, a league where men of varied backgrounds don one uniform to achieve a goal — hoisting the Lombardi trophy at season’s end — larger than their individual selves. NFL people appreciate that football, as an interracial experience, smooths the rough texture of prejudice. The NFL already recognizes some biases. 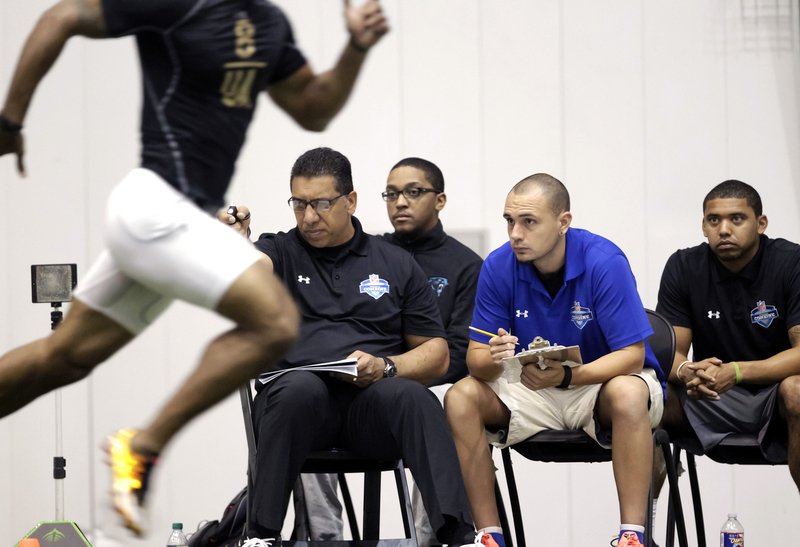 Junior Tagaloa, national director for the NFL Regional Combines, second from left, times McNeese State cornerback Gabriel Hamner in the 40-yard dash during the NFL football regional combine at the New Orleans Saints training facility in Metairie, La., Sunday, March 13, 2016. “For a while, and even to a degree now, people say be leery of the wide receiver from [the University of] Florida,” said Savage. Ike Hilliard, Reidel Anthony, Jacquez Green, Travis Taylor, Jabar Gaffney, Taylor Jacobs and Chad Jackson were all Gator wideouts taken in the first or second round who left their teams’ fans with an unpleasant aftertaste. This flavor of bias — for or against certain helmets, or conferences, or guys with warriorlike bodies — triggers hearty discussions in NFL front offices. The “undersized” Russell Wilson of the Seattle Seahawks, every time he pirouettes away from an embarrassed defensive end and slings a rainbow bomb into the awaiting arms of Doug Baldwin, reminds rudderless organizations forced to start a McCown brother that franchise-changing quarterback treasures can be found in nonprototypical chests. But implicit racial bias — that triggers nothing. The league, in its own report on diversity this spring exploring the frustrations facing ethnic minority coaches seeking employment, identifies implicit racial bias as a factor. But extending this thinking to explain what happens on draft day has proven elusive. Why is it so hard? In part, because objective measurements just mark the starting point in evaluating players. Numerical indicators of speed, quickness and power correlate with success less than fans assume, said Dan Hatman, a former scout for the Philadelphia Eagles, and both the New York Giants and Jets. 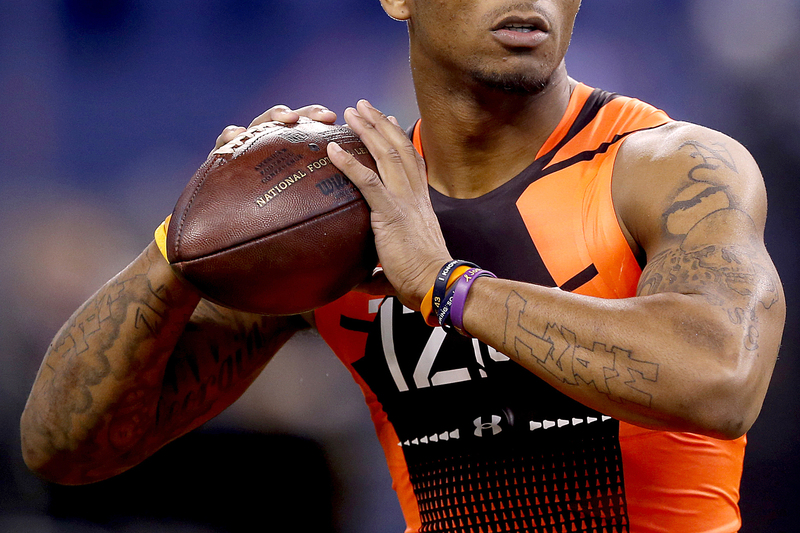 At the NFL level, “all of the players are hitting a certain threshold of athletic ability. And the standard deviation between the worst starting athlete in the NFL in a position group and the best starting athlete in the NFL is really not that large. Upon concluding that a prospect possesses the requisite athletic ability, teams evaluate his willingness to work hard, desire to be great, ability to obey rules, and intellectual aptitude to play his position. “The majority of [the misses] haven’t been because [prospects] necessarily lack talent. It’s been because they lack something inside that’s not measurable,” said John Middlekauff, a former Eagles scout. Many front offices employ personality profiling tests to help determine the mental characteristics of prospects, but those tools can be racially biased, too. Relying on them can reproduce, not solve, the problem. 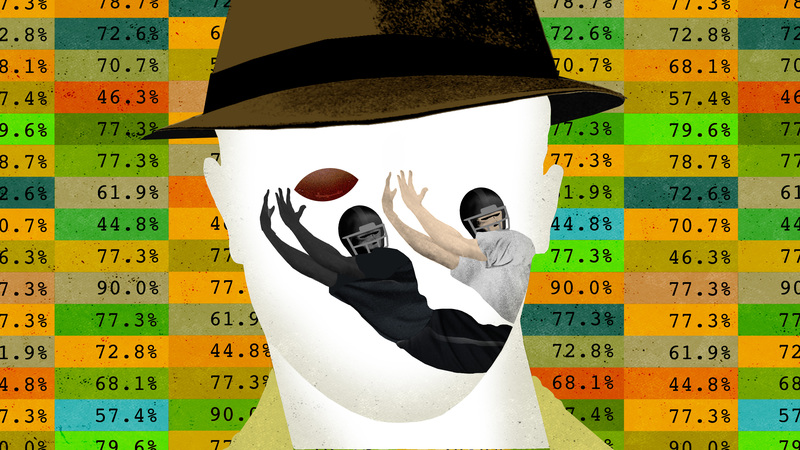 Teams, in other words, seek to measure men in ways that often defy easy measurement. And implicit bias, sneaky and ever lurking beneath the surface, can intrude into these subjective contexts. Scouts encounter so many instances where racial stereotypes have been confirmed, they develop mental shortcuts associating blacks with an unstable upbringing and possible marijuana use and whites with partying and alcohol. And if scouts conclude skin color predicts behavioral traits, they could also conclude it predicts playing ability. Scouts are implored to scout what they see. “The good organizations value the game film over everything because that’s who you are as a player,” Middlekauff said. Like everyone, however, they also see skin color. These scouts aren’t bigots. They’re Americans. Miami Dolphins general manager Jeff Ireland, at the 2012 Scouting Combine, shamefully interrogated Dez Bryant about whether his mother once prostituted. (He later apologized.) One squad in 2015 asked Detroit Lions running back Ameer Abdullah if he belonged to the Nation of Islam, his brother and agent Muhammad revealed. Equally insulting, teams view black prospects through a lens of criminality. Ex-Arizona Cardinal running back Chris “Beanie” Wells, as a senior in high school, endured a family tragedy. His godbrother was killed by a friend over marijuana or money. The cause was so trivial that Wells can’t recall what exactly motivated the senseless murder. Wells was asked about it during his 15-minute combine interview with the Cleveland Browns. “And they were going deep into the situation that I had never made public,” he said. George Kokinis, the former Browns general manager and now a senior personnel assistant with the Ravens, said through a Ravens spokesman that he doesn’t have notes from the Wells interview and doesn’t want to misrepresent what occurred. 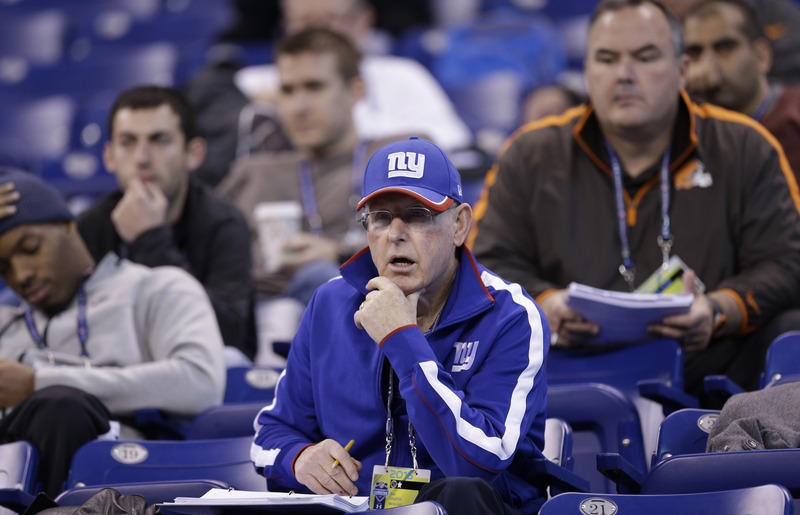 New York Giants coach Tom Coughlin watches quarterbacks and wide receivers run drills at the NFL football scouting combine in Indianapolis, Saturday, Feb. 21, 2015. Sociology professors Mikaela J. Dufur of Brigham Young University, and Seth L. Feinberg, of Western Washington University, interviewed 43 prospects who attended the combine from 1994 to 2004 for their study, Race and the NFL Draft. Their research vindicated Wells’ feelings. Black prospects, their evidence showed, sat in interview rooms as their relatives’ criminal behavior was thrown in their faces. Teams asked black prospects how many of their relatives were imprisoned. Upon unearthing a criminal in the family, teams treated prospects as though the relative’s misdeeds negatively reflected on them. Whites reported no such incidents. “At most, a white player might be asked, ‘How is your dad? I know your dad. I played with him back in the day,’ ” Dufur recalled. “I think it’s very fair,” Dufur said, to attribute the findings of the study that she and Feinberg conducted to implicit racial bias. Many skeptics will allow that perhaps implicit racial bias works against white players. But how can it be blemishing the appraisal of black prospects when the league is 68 percent black? The answer lies in Steinberg’s formulation. 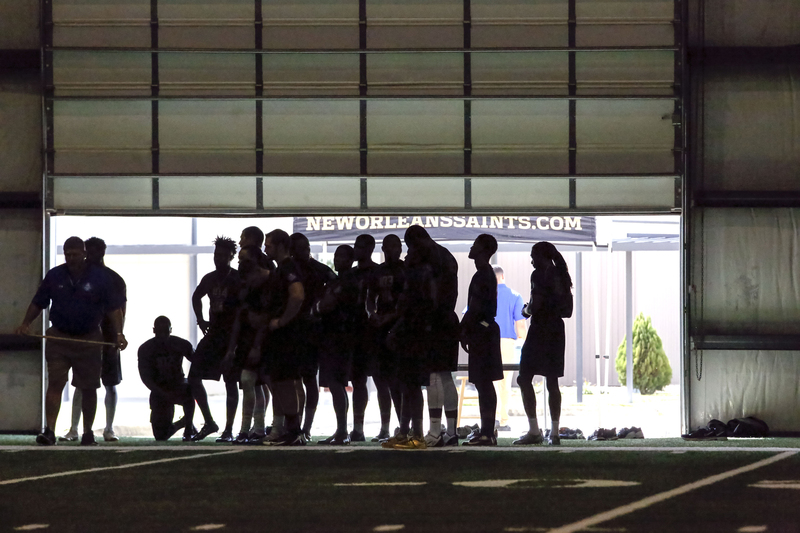 Tight ends and receivers await their next drill during the NFL football regional combine at the New Orleans Saints training facility in Metairie, La., Sunday, March 13, 2016. Black players from more impoverished, or “blacker” backgrounds receive the “mentally tough” label. Black players from middle-class, two-parent families, on the other hand, supposedly lack the passion and hunger of their poorer counterparts. Domonique Foxworth, columnist for The Undefeated and a former NFL cornerback, also notices this phenomenon: “That’s one place in football where some of … the negative stereotypes about black street kids surprisingly have a positive impact. Where they’re like, this kid is from this area. We already know he’s tough and he’s a competitor. He’s hungry. And he’s going to fight, like, literally he’s going to fight and figuratively fight, for everything. Talent evaluators, nevertheless, stretch to make same-race prospect comparisons rather than employing more fitting ones that cross racial lines, further illustrating how melanin colors thinking. Corey Chavous, former NFL defensive back and head of the drafting publication Draft Nasty, said scouts can become lazy and rely on same-race comparisons if they fail to pay attention to the specific strengths and weaknesses of a prospect. This happened with Ohio State defensive end Joey Bosa. Bosa, the San Diego Chargers’ selection with the third pick in this year’s draft, was exclusively compared to other white defensive ends, especially J.J. Watt. In an interview with ESPN.com, Bosa said he never saw the resemblance. Foxworth, then a slightly built 5-foot-11 cornerback fresh from University of Maryland, stood in a hallway of the RCA Dome in Indianapolis during the 2005 Scouting Combine, chugging water until he vomited. Might that left tackle be too flabby? Can that running back add more muscle to his frame? Is the linebacker’s hulking upper body too heavy for his diminutive legs? Walking the plank is supposed to answer these sorts of inquiries. Granted, the experience unnerved white prospects, too. But they didn’t have the same historical baggage that would lead them to assign a deeper meaning to it. And if NFL teams are oblivious to blacks’ concerns about walking the plank, then of course the subtleties of implicit racial bias might sail over their heads. Those feelings leave Stokley, a fourth-round draft pick, unsurprised. “You know, I kind of fought that all my life pretty much. When you’re a white athlete, you get overlooked. You got to prove yourself time and time again. I think that helped drive me. And I liked proving that I could be a skill position [player in football] or a point guard in basketball and be a really good player. That kind of drove me to prove people wrong because you always got those double takes at people looking twice and I liked to make sure they knew ‘Oh, my God, this guy, this white guy can play.’ ” Stokley had a 15-year career, with 2004 being his best year, amassing 68 receptions, more than 1,000 yards and 10 touchdowns. 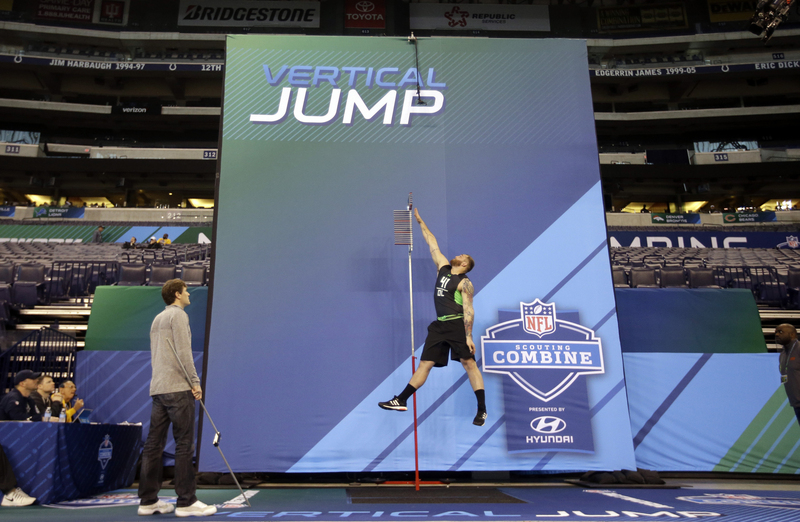 Indiana offensive lineman Jason Spriggs performs the vertical jump test at the NFL football scouting combine in Friday, Feb. 26, 2016, in Indianapolis. Before throwing to the deceptively fast Jordy Nelson with the Green Bay Packers, Aaron Rodgers, with the University of California Golden Bears, threw to the deceptively fast Chase Lyman. Entering the 2005 draft, Lyman said he thought he had “good size for a wideout with really good speed.” At 6-foot-4 and with a 4.46 40-yard dash time at the combine 4 1/2 months after ACL surgery, he accurately portrays his skill set. Yet, throughout his life, stereotypes hounded him. Lyman, sadly, re-tore his ACL shortly after being drafted, finishing his NFL career with the New Orleans Saints before it even started. Looking back, he envisions something other than racial considerations animating the slights he sustained. Maybe he’s right. Or maybe his speed truly deceived the senses, whatever that means. No matter what, however, black wideouts never encounter the hurdles he had to clear. Jason Sehorn, the NFL’s last white cornerback, said race “probably” fueled teams’ initial eagerness to put him at safety. “Nobody ever told me that. But I would say that just based on the perception of what’s out there is to automatically assume, all right, he’s a safety. Big tall white kid, put him at safety. Zaven Yaralian, the Giants defensive back coach at the time, likewise considered Sehorn a cornerback. But, said Yaralian, “When we first looked at him, everybody, including George Young, our general manager, thought he was a safety.” Sehorn, upon looking at his size and athletic ability, conjured up images of a cornerback in Yaralian’s head. A safety’s instincts — the coach just never saw them. Race-based assumptions nearly deprived the Giants of a player who ultimately improved the defense. Fans summon hope now by repeating familiar chants: The owner, in hiring that new coach, found the next Bill Walsh. The general manager reinvented the franchise after wooing those top free agents. The quarterback’s rigorous offseason regiment will catapult him, come September, onto the pedestal of elite signal callers. But nothing sparks fans’ hopes like the draft and the ability of their teams to evaluate talent well. But the NFL’s talent evaluators, with few exceptions, grew from American soil and the racial stereotypes that flourish here. We can witness the power of their implicit racial bias by whom they select on draft day, rejecting some prospects who should be on their draft boards and shielding others who should be off. And most of them never sense the flaws in their search for diamonds that can shine on Sundays.